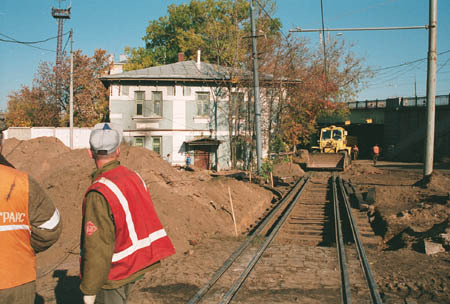 Since October 30, 2000, the tram network of Moscow lost a tramline along Sergey Makeyev Street, Zvenigorodskoye Shosse, Trekhgorniy Val and Schmidtovskiy Proyezd. Simultaneously, a new terminus was opened near Vagankovskiy Bridge. The terminus, named Vagankovo, was used by route 23 instead of the former Schmidtovskiy Proyezd terminus. But its life was not long, and this loop was also closed in May 2002 with the next shortening of Route 23. 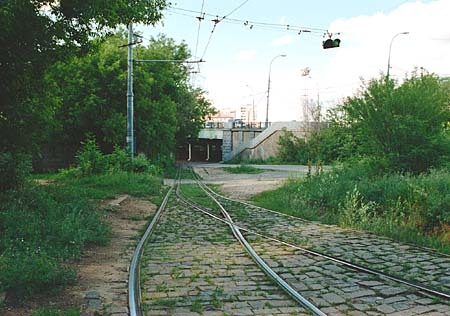 A section of interlaced tracks, or gauntlet, for a few decades existed near Vagankovskiy bridge. 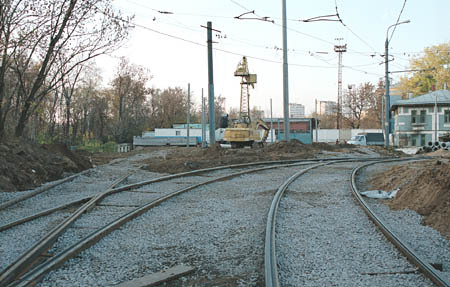 This line connected the Krasnopresnenskoye Depot with the main tram network. There was a narrow passage between the overpass and a building (obscured by trees in this photo), making it impossible to construct a "normal" double track line here. 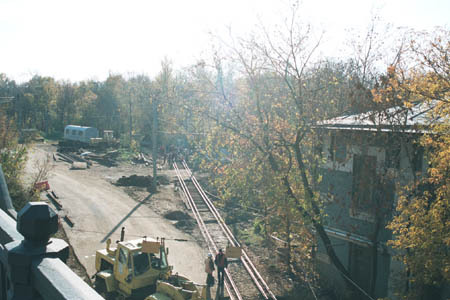 A reconstruction of this line was begun in October 2000 because of planned closure of tramline towards Schmidtovskiy Proezd. A new terminus was to be built. Trees have been felled to make room for the tracks of this loop. The interlaced section was converted to a single-track line with turnouts on both ends and a turnout to a new terminus in the middle. A view of construction works from Vagankovskiy Bridge. The construction works were almost over by October 20. No overhead wires were installed yet, but the tracks were ready. 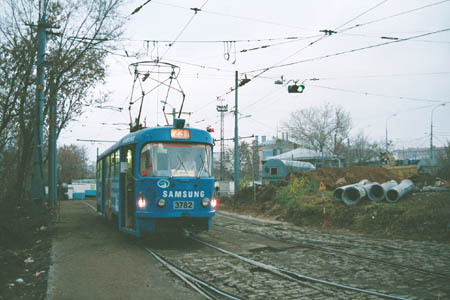 Tram 3782 at Vagankovo terminus on a gloomy November evening. 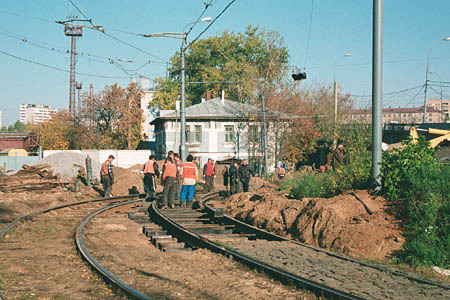 Tracks of this terminus disappeared in June 2002 as quickly as they had been installed. The next page will show you all that was left of this loop in August 2002.